One way to support your children's musical interests is to help them make instruments of their own. Flutes take little time to make and are fun to play with afterward. They also make less noise than drums and tambourines, so they benefit parents as well as children. You need only a few things to make homemade flutes, and even some old recycled household items will do the trick. Make a mark 2-1/2 inches from the end of the tube and a second mark 3/4 of an inch from the first mark. Connect the two marks to make a small rectangle 3/4 of an inch long and 1/4 of an inch wide. This creates the dimensions for the mouthpiece. Measure 5 inches in from the mouthpiece end of the tube. Make a small mark for your first finger hole, then make five more marks below it, each 1 inch apart. This creates six marks for six finger holes. Use your utility knife to cut out the rectangle for your mouthpiece and a small circle for each of the finger holes. Each finger hole should be about the size of a pencil eraser. Cut a circle of paper about 1 inch larger in diameter than the opening of the tube. Place the paper over the end closest to the mouthpiece. Glue the paper in place by folding the excess paper down over the outside of the tube. Decorate the flute using paint and pieces of colored paper glued in patterns along the body. Let the glue and paint dry completely before playing. 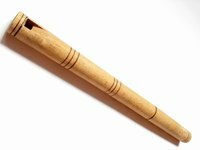 This flute won't actually make any sounds on its own. Children will have to simulate the sound themselves by humming while they play.